It’s no doubt Plantar Fasciitis is the most common cause of heel pain. The pain can feel like a stone bruise, a sharp dagger, deep throbbing or a dull Ache. 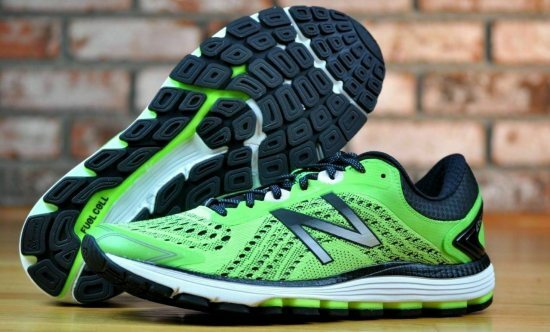 Leading footwear manufacturers like New Balance have finally discovered what makes a shoe good for Plantar Fasciitis and embedded that technology right into the soles of their shoes. Before we dive right into it, here’s a quick comparison of the top rated 4. The New Balance 99 x-series is pretty well-known. Most people are familiar with the 997, 998, 999 and even the 996, which are all great shoes. 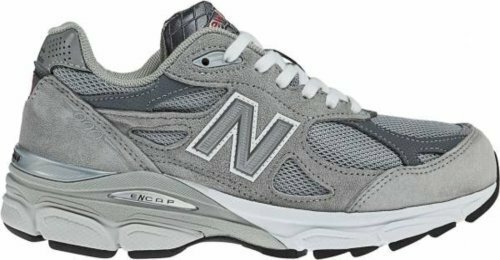 If you shop New Balances made in the USA brand, then you’re definitely going to see a lot of good quality shoes of any of those models I just mentioned. The same goes for the 990 which is kind of the originator of the whole series. The 990v1 apparently first dropped in 1982 (1 year older than me). It was the first retail sports sneaker that was $100. That was pretty much a landmark release and a $100 back in 82 was a lot bigger of a deal than $100 today. New Balance thought that they were only going to sell a few 990s, but instead, they wound up selling 10 times what they thought initially. The 990v1 is the easiest to identify because it’s the most retro-looking of any of the other 990 version. Moving on to the V2, one of the prime differences you can see right away is that they bulked up the midsole significantly or at least the look of the midsole is a lot bulkier. The toe box is starting to take shape with the extra little panels of suede that have little strips that go up on either side of the toe box. So that’s really how you can tell the V2 apart from the V3 or the V4 because it has the bulkiest midsole and it still has sort of a retro look to it though. 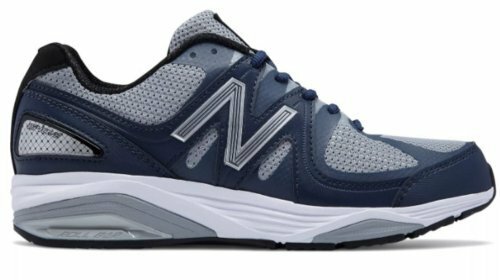 Moving on to the 990V3, New Balance slimmed down the midsole a bit and they just kind of changed how it looks, but it’s definitely a lot smaller and less bulky than the V2. 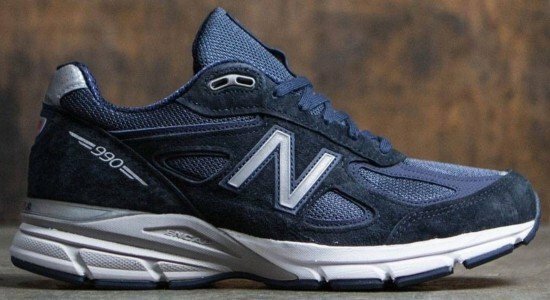 This is the version where New Balance really started to take the ‘dad shoe’ vibe and really make the 990 a dad shoe, at least from today’s perspective. 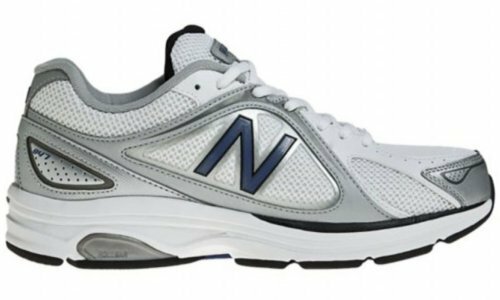 Last, the 990v4 basically looks very similar to the V3. They just changed the paneling ever so slightly as a replacement of the mesh and the suede. They’ve also changed the midsole a little bit. 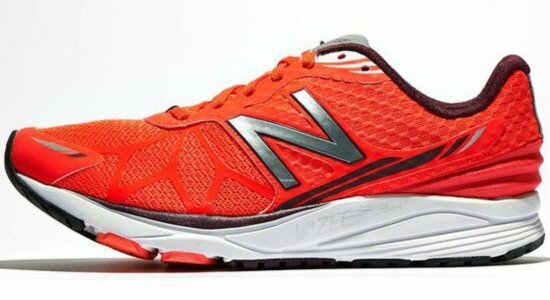 Overall, New Balance has added some newer technologies and just a little bit better balancing. The 990 has always been sort of a mix between support and cushion. So New Balance tweaked the ratios of different materials they’re using in the midsole and they’re constantly playing with that making the 990v4 the latest optimized version. This iconic sneaker has never stopped feeling fresh. It is built to give you a nice energized cushion with every single step that you take while you’re out there on the road. Here are the top three reasons the New Balance 990v4 is a massive fan favorite. The upper is made of a breathable mesh with pigskin leather layers on top of that for amazing durability. The upper has that athletic appeal and a classic quality that’s truly enduring. It has a nice sub closure in the front to lock your foot in. The inside features really a soft and breathable lining with some nice padding around the sides. The footbed is designed to keep your feet feel great on the interior. The ENCAP midsole and blown rubber outsole provide stable cushioning that’s as durable as it is reliable. The V4 has a 12mm heel-to-toe differential. The midsole features EVA that is incredibly lightweight and shock-absorbing to give you amazing energy return with every stride. The 990v4s are made in the USA and you can wear them proudly. Whether for everyday wear, work, walking or running, the 990v3 is one of those shoes recommended by most Orthopedic surgeons. This shoe is by far the best New Balance shoes for Plantar Fasciitis hands down. Extremely comfortable, the 990v3 provides all the support, cushion and stability your Plantar Fasciitis needs. Its ample support and stability will bring your foot back to level allowing you to run as long as you want while absorbing all the harming shock your foot is subject to. People who have walked or run in the 990 swear by its efficiency and a great number of them say this shoe is the only one that really cured their Plantar Fasciitis. Some people say the 990 also cured their bad knees, bad ankles, arthritis of the foot, back pain, heel spurs, shin splints, and calf problems. All in all, the 990 is a great supportive and stable shoe that will certainly let you stay on your feet all day without all the aches and pains you might have been dealing with. Sizing is pretty close but maybe a tad narrow for their normal sizing. Consistency, quality, and support are signature features of the well-loved New Balance 928 v3 walking shoe. What we have here is a shoe that is made with a smooth leather upper. It features a lace-up closure so that way you can get the best and adjusted fit. We do have a padded tongue and collar to give you more support on the ankles as well. While the interior has this amazingly soft lining that is made of fabric, it’s going to feel really great against your foot. Not only that but it’s treated with anti-microbial properties to really give your foot a healthy and environment. And the shoe also includes a removable footbed. Here are the top three pieces of technology that contribute to its assured comfort. This unique tread pattern is specifically designed to help guide your foot into natural motion. The ROLLBAR technology stabilizes rear foot movement and helps keep the walking motion steady and consistent. The Abzorb insert in the midfoot provides extra cushioning that’s plush but never unstable. Everything sits on top of a durable Walking Strike Path rubber outsole. The 857 v3 are one of the best walking shoes for plantar fasciitis. They have a structurally supportive synthetic leather upper with mesh panels beneath that to keep everything breathing. The upper comes with the New Balance signature logo is showing off on both sides. There’s lots of padding around the ankle for comfort. The insole is removable and gives you lots of cushioning and great flexibility, and if you have your own orthotics, you definitely put those inside the shoe as well. It does have a Lightning Dry Lining on the inside to keep your feet nice and dry even if you’re sweating. It does have a Lightning Dry Lining on the inside to keep your feet nice and dry even if you’re sweating. There’s an ABZORB midsole to give you a ton of shock absorption and there’s also a ROLLBAR posting system so that way it reduces rear foot pavement. Everything is on top a rubber outsole that does have Ndurance rubber throughout so that way you get nice traction and grip. Take great leaps in a great shoe like the 847V3 from New Balance. 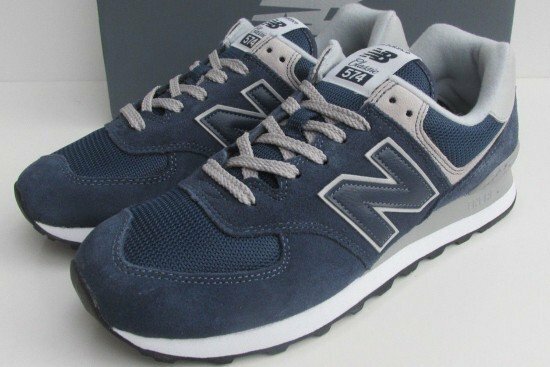 The New Balance 574 was actually introduced in 1988. The 574 is not an original design because it was inspired by the 575 and the 576. So, both the 575 and the 576 had very nice details on certain parts of the shoe and New Balance took bits and pieces from each and combined them into one, the 574. So, that’s how the 574 came to life. The whole goal for New Balance behind the creation of the 574 is that they wanted to create a pair of shoes you can wear for working, walking, running on roads or even running on some light trails. The 574 had remained unchanged for about 15 years and then I guess somewhere in 2002 the shoe has seen a lot of modifications leading up to now. New Balance created the 574 model to cater for skaters, golfers, and hikers. The latest design modification New balance created is last year’s 574s Sport. In 1982, New Balance changed the Footwear industry, once again, by introducing another model that cost $100. The style offered in great suede was a move away from the bright neons and pops of color that dominated the running industry. The grey suede became synonymous with New Balance ever since. Recently, New Balance released the classic 574 in the original grey colorway. New Balance is back again with the classic 574 logo with suede, vintage mesh, and the classic stitching simplified seam construction with a reduced toe height and improved heel shape. The 574 is the original all-purpose lifestyle sneaker from New Balance. The 574 is more than the sum of its parts. These are the top three features to know about this classic design. Did you know the numbers in New Balance style names actually mean something? The 7 refers to the brand’s light stability category and the 4 is a nod to the 574’s predecessors, the 575 and the 576 from which they lifted some of its best qualities. The 574 is a core style with some significant history. Developed in the 1980s, this shoe was the first truly go-anywhere shoe. Whether or not should be considered athleisure trailblazer, it’s up to you. It’s comfy to boot. The ENCAP midsole is comfortable and cushy which makes it perfect for work, weekends, and beyond. Heel stability wasn’t that good and New Balance has reinforced the heel counter with a plastic panel to control heel movement more efficiently. The New Balance 574v2 tends to run a little bit small, so consider ordering a half size larger for a perfect fit. If you wake up one day full of energy and want to go for a run in the nearest jungle, the 574 can take you there and back thanks to its rugged outsole that offers some decent traction and stability on uneven terrain. If you’re planning for an upcoming vacation, you should know you’ll be supposed to walk for long periods of time. However, why all the trouble planning a vacation if you experience fatigue or foot pain during the walk afterward? 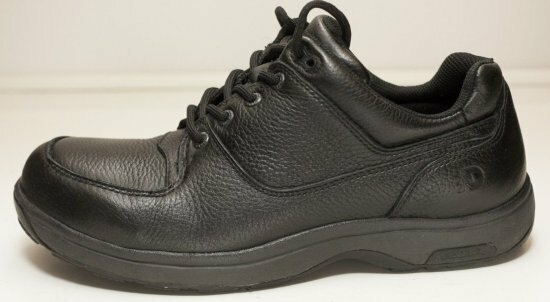 Recommended by most podiatrists, the 927 is a comfortable shoe with great arch support making walking and prolonged standing even on concrete much enjoyable for people who suffer from heel pain caused by plantar fasciitis. The 927 is in the walking category. It’s one of the most recommended styles in the medical industry. It has a nice wide toe box and comes in multiple widths. So if you have a wider foot and really need something to accommodate your orthotic, the 927 is fantastic for that. It also has a deep heel cup for stability and the ROLLBAR TPU medial and lateral posting. The Rollbar is a graphite feature built in the heel and designed to minimize rearfoot movement. This means it’s going to keep your feet aligned so they don’t pronate or supinate offering a really nice motion from heel to toe. Adding to that, stability is even more enhanced with the TS-2 posting that provides the ultimate in motion control. It also features a rocker outsole with NB Walking Strike Path which is going to facilitate the transition for you and correct your gait when you walk. So for those people who have Plantar Fasciitis, Arthritis, Achilles Tendonitis or any kind of sensitivity in their feet are going to find the 927 really nice addition to their shoe arsenal. 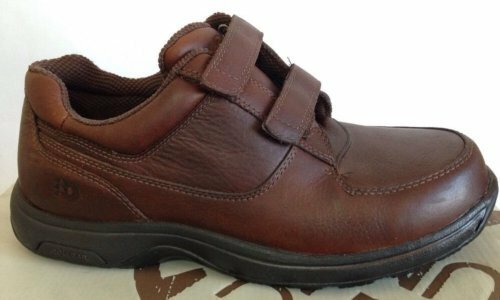 The 847 is a men’s and women’s walking shoe for people with Plantar Fasciitis who need a lot of support and motion control but don’t want something heavy or stuffy. This is a walking shoe that really looks more like a running shoe. The first thing you’ll notice is how much synthetic rubber and mesh is in the upper. This makes the front of the shoe a lot more flexible and a lot more breathable. It also has mesh on both sides, which serves as a bunion panel for people who have the swelling on their bunions. The styling is also just a little bit more current and colorful. But style isn’t everything now and this shoe still has it where it counts. It’s built on an SL-2 Last, which basically means it’s got a little bit a wider forefoot and more of a narrow heel. What’s nice about this shoe is that it is lightweight and it has a Graphite Rollbar all around the heel with medial and lateral support for enhanced stability and support. Its Walking Strike Path on the outsole keeps your walking gait going straight with every step while offering a nice and smooth transition from the heel to the forefoot. You’ll also find a Lightning Dry Lining to wick away moisture and an Ndurance outsole for maximum durability. One benefit to this shoe is whether your arch collapses and your feet roll inwards or whether you tend to roll outwards more, this is going to be a great shoe for you. 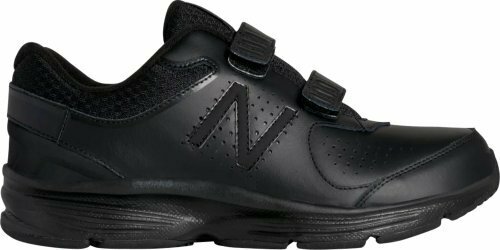 Get moving in a supportive and comfortable shoe with the New Balance 411 and don’t let your Plantar Fasciitis or any heel pain get in your way. The NB 411 has a really sturdy construction. It will provide amazing comfort no matter what type of conditions you’re walking and your feet will feel great. It features a sturdy man-made leather upper with the logo detail for added appeal and synthetic overlays for durability. The inside features a fabric shoe lining with a foam cushioned footbed for added comfort and great moisture wicking. The lace-up system gives you a secure fit with a padded collar and tongue for additional support. You have perforations throughout the upper giving you some added breathability. The 411 also features an EVA midsole that’s going to help keep it super-lightweight but always provide that comfort and shock absorption. It all sits on a rubber outsole featuring the Waking Strike Path right in the middle that’s going to help guide your foot throughout the gait cycle keeping it feeling nice and steady while delivering great flexibility. You can check the 411v2 here. 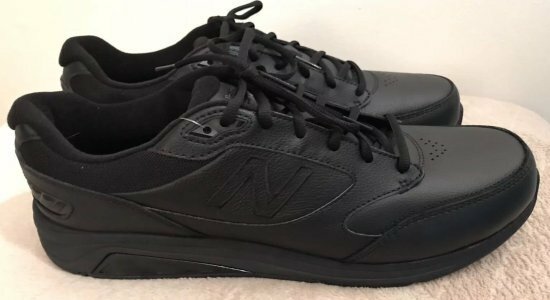 Plantar Fasciitis needs as much support as possible, and New Balance is one of the few companies that have done a great job so far catering all widths and sizes. The Winslow is made of really nice leather. There’s added cushioning all throughout the shoe while its removable footbed gives you a ton of support, cushioning and comfort and it’s going to leave room for your orthotics. The Winslow is a well-constructed shoe that provides incredible arch support, ankle support, and heel support. Its two hook-and-loop straps are there to make sure you have that customized fit and also spare the arthritis sufferers the trouble of bending over to tie their shoelaces. There’s a Rollbar technology in the back which is going to make sure your feet stay nice and stable inside. Its slip-resistant outsole has a really nice flat platform to give a ton of stability. 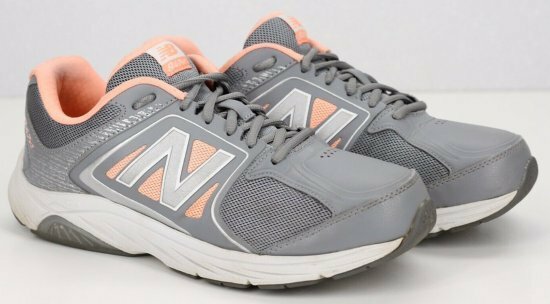 You have Abzorb cushioning in the forefoot and in the back, and this is the same stuff New Balance use in their athletic shoes to give you that performance and comfort you’re looking for. All in all, the Winslow is supportive, comfortable, lightweight, durable, water-resistant and easy to put on and off. In short, the Winslow is a real winner with a perfect fit and great support for Plantar Fasciitis. Available in extended sizes and widths, Dunham is all about tradition. They’ve been around since 1885. Since partnering with New Balance, it’s become a tradition of comfort and fit. The Windsor is a classic oxford that’s perfect for those hard to fit feet. It’s also waterproof to keep your feet nice and dry in case you get caught in one of those downpours. The premium seam-sealed tumbled leathers and extra padding in the heel and forefoot surround the foot in soft supple comfort. The hidden ROLLBAR provides stability in the heel. The nice removable footbed gives you even more added cushioning and support down there and leaves some room for your own orthotics. It has metal eyelets for easy lacing, generous padding all throughout, and really a smooth lining. The midsole is very shock absorbing with the built-in ROLLBAR technology on the heel to keep you nice and stable. The bottom has a fiberglass piece to really give you that support you need. The outsole has a nice wide platform and it is made of Tru-Trak soft rubber that’s incredibly sticky. The outsole also has two ABZORB cushioning areas, one in the heel and one in the forefoot. This is the same stuff New Balance uses in their athletic shoes to give you that performance and comfort you need. From sizes from 8D to 18 6E, the Dunham nearly got every size covered. 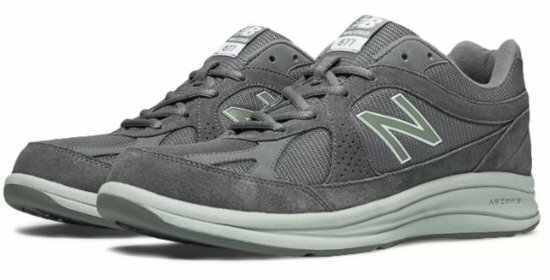 The balance and support the New Balance 577 offers is going to be long lasting and also very dependable for your Plantar Fasciitis. The 577 walking shoe has an incredibly tough rubber outsole with a ton of reinforced stitching. It offers a lot of heel stability with a reinforced panel at the toe. The lace-up system offers a secure fit while the pillowy soft lining in the collar and at the Achilles together with the removable footbed provide added comfort. The footbed offers a lot of shock absorption giving a great comfortable feeling to your feet. It features a big thick layer of Abzorb EVA which absorbs the shock and dissipates it taking all the beating. It also has a very stable and supportive base and a textured outsole that has the Walking Strike Path. It’s an incredibly comfortable supportive walking shoe that is one of the best shoes for Plantar Fasciitis. Comfortable and supportive, the New Balance 877 walking shoe is made with incredibly soft suede with breathable mesh panels all throughout to keep your feet cool. It features a lot of cushioning around the collar area as well as in the tongue. There’s a comfortable and shock absorbing footbed that is going to give you some added cushioning or leave room for your own orthotic. There’s Abzorb cushioning in the midsole, which helps keep the weight down and take all the beating thanks to its highly shock absorbing material. It also has a wide toe box and sufficient support for walking. There’s a really nice flat platform on the outsole with the Walking Strike Path to help keep your feet aligned. The MW877 falls a little bit short in arch support. 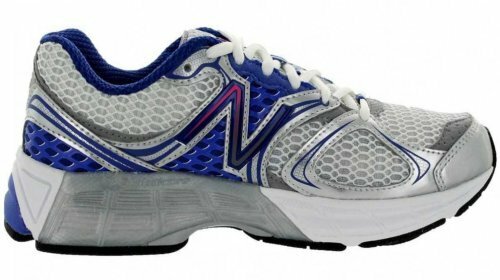 First off, the 1080v9 is one of the best New Balance running shoes for Plantar Fasciitis. Ever since they added fresh foam, it’s been solid for me. Will this new update continue to keep this shoe fresh or if they decided to go mess it all up? The Fresh Foam 1080v9 brings back a similar engineered mesh that is nothing special. But that’s ok because it hits all the marks. It’s breathable, feels good on foot, keeps your foot supported, and it’s a tad lighter. I appreciate it when shoes could get the basic things right. But what I kind of like of is the step that New Balance took in making this upper much more seamless and clean. Not that I really had a problem with the extra overlays from a functional standpoint, but I appreciate how much more clean the shoe looks. The 1080 has always been that bulkier clunkier type of shoe, but when I first put this shoe on, I noticed just how slick the shoe felt. Gone are all the excess padding on the tongue and in the heel. The 1080v9 feels like it just went through a bad breakup and got all motivated to lose some weight and get in shape and find her a new man. You still have that luxurious comfort feeling but in a much more modern package. New Balance has taken a risk with this kind of change. When I first saw this update, I thought New Balance might have ruined the comfort of the shoe. But I am pleased to say that you’ve got it right. Now the midsole is where all the fun happens. Fresh Foam is New Balance’s a softer and a plusher cushioning technology. New Balance always seems to be modifying their fresh foam formula. But to skip all the technical jazz, how does the new fresh foam feel? Is it still soft? Yes. Is it still plush? Definitely. But is the softest 1080 yet? I would say not quite. Compared to the 1080v9, the 1080v8 has just a bit more of a plusher taste to it, but I would say the 1080v9 is still softer than most shoes out there. Compared to previous models, the 1080v9 has a bit more of snappier feel. The 1080 series has always been my slower longer-run shoe, but this version has a bit more spark to it and I’m not mad. They also continue to use a varying level of blown rubber throughout the shoe. The inner layers are a bit softer for a plusher feel and the outside layers are a bit tougher for durability. New Balance has added some flex grooves in the midfoot, which is a good attempt to give the shoe some flexibility. The Fresh Foam 1080v9 made some changes that I wasn’t quite expecting. When it comes to change, I’m a bit of a sensitive person. But I think New Balance gave me something that I didn’t realize I want it. The fit still has that wide toe box that fits my foot so well. The transition in the shoe has improved and the overall look of the shoe looks better. The New Balance Fresh Foam 1080v9 is not going to replace any of your fast day shoes. However, if you need that workhorse shoe that can long and provide that impact protection, it would be tough for me to suggest anything much better than this. The premium stability 1260 series continues in its 7th version to deliver the ultimate plush experience for Plantar Fasciitis sufferers. With the 1260V7, stability is still guaranteed mile after mile. With an 8 millimeter heel-to-toe offset, the 1260 v7 offers plush cushioning for moderate to severe overpronators. With a completely revamped construction, this shoe should offer a more responsive ride than its previous version while still providing maximum support. Thanks to the new minimal seam upper design, unwanted hot spots and irritation should be limited for a more comfortable running experience. The upper features a full-length engineered mesh which is really nice and breathable. The reason why I like the 1260v7 is because it has a wider toe box and your toes have a little bit more room to spread out so you could really grip the ground when you are running. The wide toe box is combined with the asymmetrical heel counter design that ensures rearfoot stability through its intuitive shape and smart design. It really locks your heel in nice and tight preventing it from slipping out in and out of the shoe. So, you have a nice stable ride from the top of the shoe all the way to the bottom. Moving on to the midsole, you have the full-length ABZORB midsole which goes around the entire shoe. It really gives you a lot of cushion from your heel all the way to your toe off. It allows for safer strides slowing down negative forces that cause the feet to roll inward (overpronation). The 1260v7 continues to provide ample cushioning while the addition of the Fuel Cell technology adds a more responsive ride and gives you that much more cushioning and shock absorption from your heel all the way to your midstance. A redesigned outsole helps give the v7 a smoother transition without sacrificing durability or traction. The 1260V7 delivers new ways of cushioning, new ways of stabilizing and enhances the overall plush premium stability experience for the long run. Last but not least, the 1260V7 is not only lighter in weight but more flexible than the competition without losing any torsional rigidity and support. Getting your feet into the Vazee Pace is like a nice welcome hug from a relative you haven’t seen in a long time. 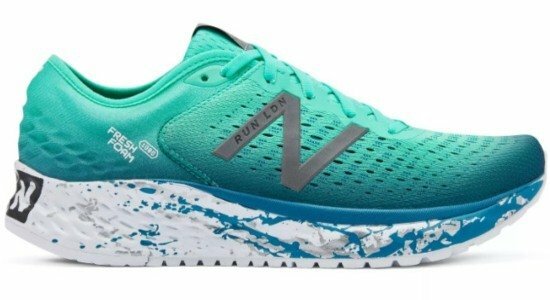 This whole line of Vazee shoes from New Balance is replacing the 890 series. The Vazee Pace is more of a traditional trainer that’s going to put in a lot more miles. The REVlite midsole is a great material New Balance has been using in a lot of their shoes because it’s responsive and has cushioning in it. Its responsiveness mixed with the softness provides such a nice feeling. It features a wider and stretchier toe box which gives ample room for your toes to move comfortably when you push off. The welded overlays provide more security and fit. Right around the ankle, it’s really grippy and catches on to your feet and your ankle really well helping the foot not to slip at all. The collar is cushioned and foamy making walking around or running in this shoe very comfortable. The back of the shoe has some firm ridges that help secure your heel and your Achilles. The outsole is segmented and has deep grooves and a very durable rubber tread that help with transitioning. The arch has like a boot-like, kind of massaging and hugging piece. It’s also really similar to the New Balance Fresh Foam Zante below, but it has some differences that make it stand out as a quality mid-distance more responsive version of that shoe. All around, it’s a very comfortable shoe. 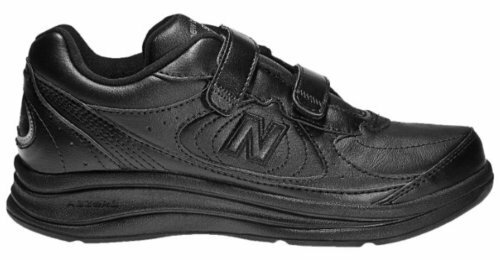 The upper is a bit less durable than other New Balance models. You can check the New Balance Vazee Pace V2 here. Built with maximum support and cushion, the performance-driven M940V2 really goes the distance. An attractive synthetic and mesh upper keep the feet secure and dry on longer runs. Moderate to severe pronation is thoughtfully addressed in this shoe with its medial post and a unique T-Beam support shank. For flexible mobility with each step, New Balance has also added deep flex grooves to the forefoot. And finally, it features N2 low-to-the-ground cushioning which allows for a plush bouncy ride while maintaining a low profile fit. With a 12mm heel-to-toe differential, the 940v3 is ideal for the overpronator looking for stability along with high energizing cushioning. It features breathable mesh and supportive synthetic upper materials to keep your feet cool and comfortable. The upper has a no-sew design meaning there are no seams or stitches that are going to irritate your foot on the inside. There’s a plush tongue and collar which is really going to give cushioned comfort around those ankles especially. The inside has a breathable fabric lining to offer a wonderful in-shoe feel. There’s also a polyurethane insert as well to give a more comfortable ride. There’s also a dual-density ABZORB midsole that features a blend of foam cushioning and compression sets. The midsole is very lightweight, shock absorbing, and gives you plenty of energy return while you’re out there running. It all comes on a durable blown rubber outsole to keep you steady over a variety of surfaces. Take your performance and your style to a whole new level with the 940V3. With a 6mm heel-to-toe drop, the Fresh Foam Zante V2 is a performance uptempo running shoe designed for the neutral runner. Runners all around the world have fallen in love with the Fresh Foam Zante and these speed seekers can rejoice because version 2 is just as fast. 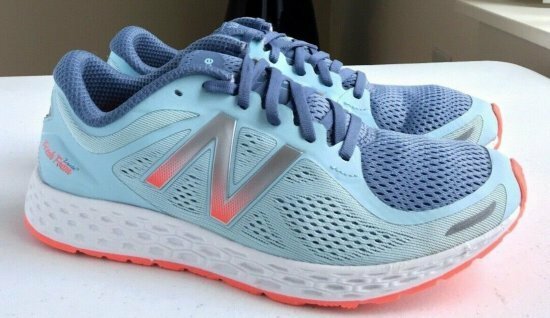 The Fresh Foam Zante Version 2 continues to capture what runners have grown to absolutely adore about this ride and makes better tiny little things that New Balance wanted to make better. In the Zante V2, New Balance really paid attention to that feeling of fast that runners have really enjoyed. The Zante V2 stays on the VL-6 last with midsole heights of 16 inches in the heel and 10 in the forefoot. The runners also have the same amount of rubber on the outsole engineered in a way to allow them to move quick. In the upper, you do have a sleek booty construction and really really focused engineered mesh and seamless overlays to allow for a great upper fit and a snug irritant-free wrap. The sleekness of the Fresh Foam Zante exists heel to forefoot, upper to midsole and New Balance wants runners to continue to enjoy that awesome feeling of fast. Just like the Fresh Foam 1080 model, the Zante V2 has a second skin-like feel with the Ortholite sock liner and data-designed grooves on the outsole. Utilizing an updated fresh Foam midsole with convex hexagons throughout the medial side and concave throughout the lateral, the second version of the Zante provides a smooth transition at tempo paces. Along with a new carbon outsole formed through heat mapping, the Zante V2 was designed to provide plenty of traction and durability. Awarded the Best Buy by Runner’s World magazine in March 2016, the New Balance Fresh Foam Zante V2 is great for speed training or if you just need a stylish low-profile everyday-wear comfortable shoe. Last but not least, I wouldn’t recommend using these shoes as mild running shoes because they tend to wear much faster. This amazing motion control shoe is completely breathable with tons of mesh all over the upper. Motion control shoes have a medial post on the inside of the shoe that’s designed to stop the foot from rolling too much to the inside for somebody who overpronates. Yet, in a lot of cases with motion control shoes, especially if they’re being coupled with an orthotic, they can tend to overcorrect the foot. 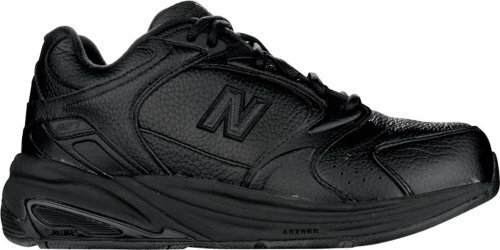 The good thing with the New Balance 1540 is that it has the medial post and a lateral post as well to limit the amount of break down on the outside of the shoe. There’s even a removable footbed that allows you to completely customize the shoe by putting in your custom orthotics which is pretty sweet. But all the main tech is in the midsole which offers tons of added stability, shock absorption and pronation control exactly where you need it the most. Plus, the Rollbar is gonna give you a smooth transition from heel strike to toe-off. You even have an Impact Guidance System in the bottom as well that provides super-duper flexibility. The shoe also has a very good rocker system so as you walk, it rolls you through. It’s great for a lot of different conditions. If you need added support and tons of comfort in a great running shoe, look no further. It does come in multiple colors and multiple widths. Check the New Balance 1540v2 here. Plantar Fasciitis is the tearing inflammation and degeneration of the Plantar Fascia, a long ligament on the bottom of the foot. The inflammation is the result of small micro-tears within the Plantar Fascia. The inflammation causes pain at the inside of the heel where the Plantar Fascia inserts on the heel bone. The traction on the heel bone from stress to the Plantar Fascia may cause a heel spur to form. Although heel spurs are commonly seen on X-ray, they are rarely the cause of pain. The cause of Plantar Fasciitis is multifactorial. The abnormal motion in the feet, usually overpronation, in combination with an unsupportive pair of walking or running shoes and overuse can cause microscopic tears in the Plantar Fascia and start the process. Supportive shoes are one of the most important steps. A shoe that is too soft and flexible will strain the Plantar Fascia with each step. Think about the shoe as a brace to the ligament protecting it while it heals. An ice massage with a frozen water bottle for 15 minutes, two to three times a day will both stretch the Plantar Fascia and decrease inflammation. A heel lift can decrease the stress on the Plantar Fascia. Tight calf muscles lead to the heel coming off the floor early, which places excess stress to the Plantar Fascia, which results in tearing inflammation and pain. Taping is a method designed to take stress off of the Plantar Fascia to allow it to heal. The method shown is the Low Dye Strapping and can be an effective short-term treatment. Orthotics are rigid devices placed inside the shoe and designed to control abnormal motion and prevent arch collapse. By placing the foot in the correct position, it will take stress off the Plantar Fascia and allow it to heal. Night splints can be very beneficial as they help keep the Plantar Fascia stretched out while you sleep. When sleeping, the foot is in a relaxed position. During the night, the cap and the Plantar Fascia contract and tighten and in the morning, they are in a tightened shortened position. When the full body weight is placed on the foot, the Fascia becomes overstressed and tears. Night splints hold the ankle up and hold the toes back stretching both the calf and the Plantar Fascia during the night allowing the Fascia to heal in an elongated position.